In other words, pretty much the entirety of the 20th century warming in the U.S. “measured” by the world’s primary temperature record gatekeeper may be fake. Note the blue actual measurements: not much warming. Then look at the red adjusted data: now that’s what a global warming trend looks like. A faked global warming trend, that is. 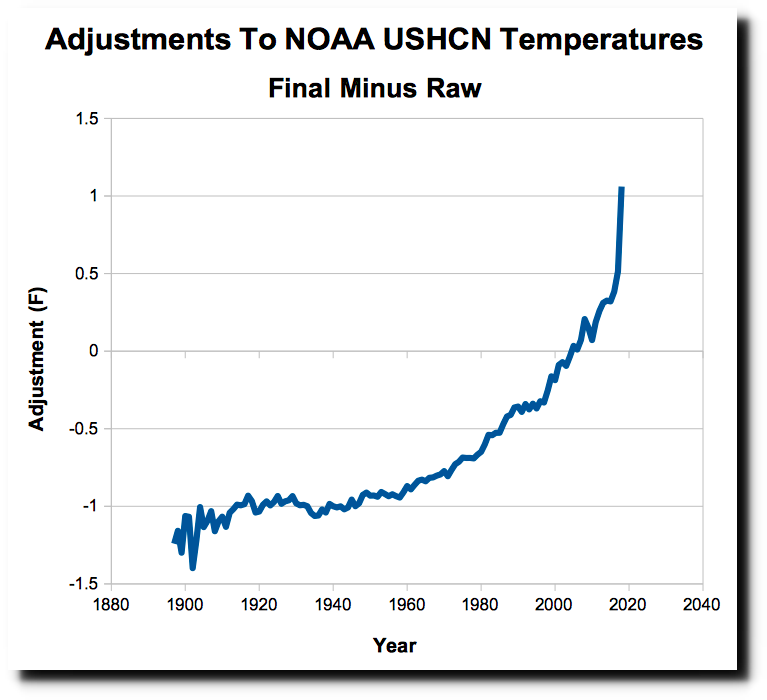 The effect of all this data tampering is to produce a hockey stick shape not dissimilar to the one cooked up by the discredited Michael Mann. But surely a government-funded organization like NOAA, staffed by actual scientists with PhDs, can’t literally be making stuff up? But this brings us to the most damning part of Heller’s investigation. The adjusted temperature data may be pretty dodgy, but it turns out the fabricated data is as bent as a nine bob note. 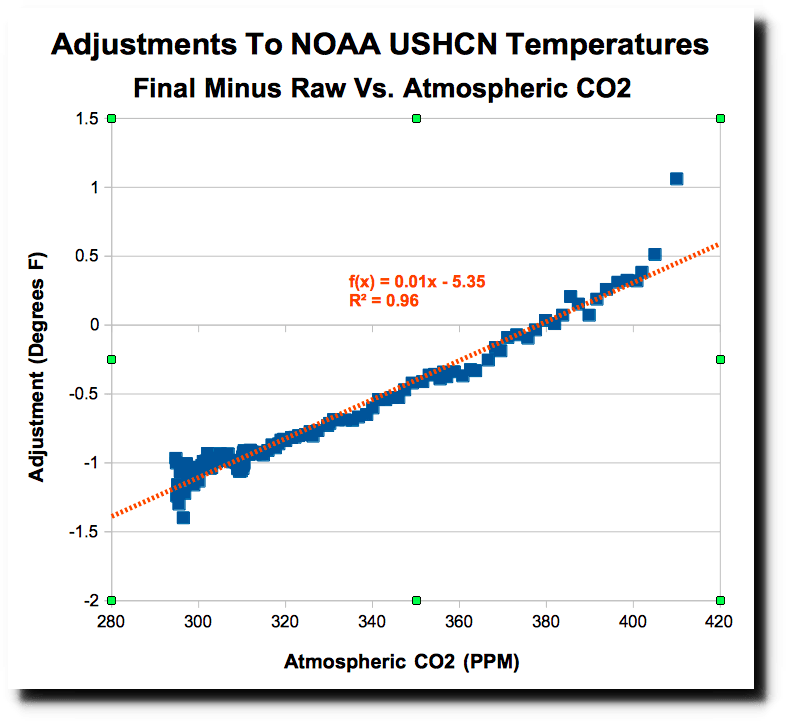 See how cavalier the NOAA gatekeepers have grown with the most recent data? The odd one or two degree embellishment here and there might be not be too noticeable. But four degrees? That’s just taking the mickey. We know why they’re doing it too. They’ve got these computer models which are programmed to tell us that as anthropogenic CO2 emissions rise so will global warming. But reality isn’t playing ball. So rather than correct their computer models, they’ve decided it’s much easier to adjust reality to match their increasingly threadbare-looking global warming theory. This cannot be stressed too often. One of the great lies told by climate alarmists is that the world’s various temperature gatekeepers operate independently of one another – and that the fact they have all reached the same conclusions is confirmation that they must be right. But they’re not independent of one another at all. 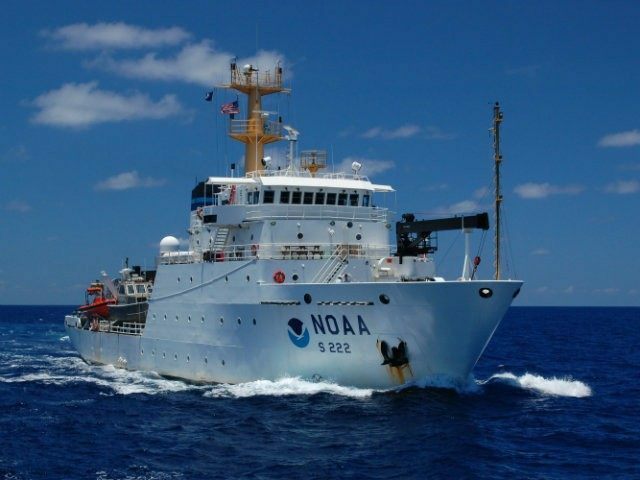 There are many problems with what NOAA is doing. 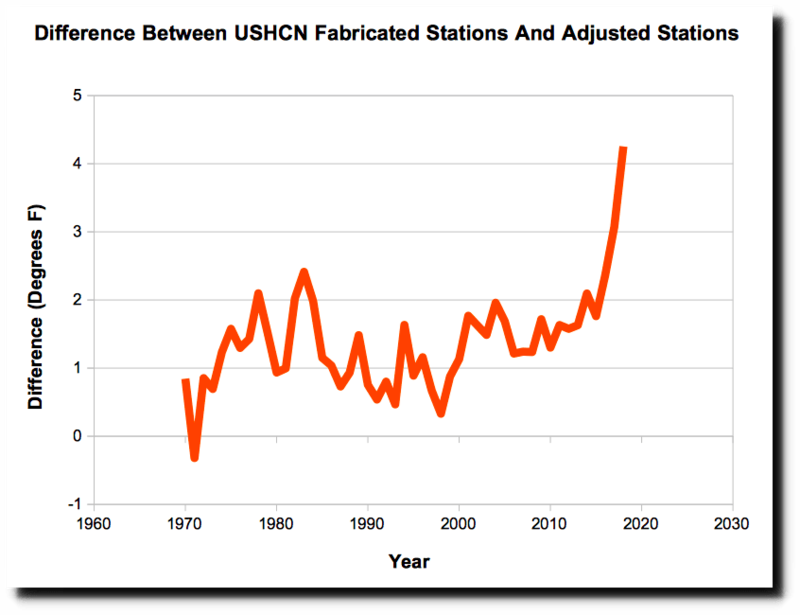 The first is that they are turning an 80 year cooling trend into a warming trend, which has massive implications for both climate scientists, journalists, voters and policy makers who depend on the accuracy of their work. 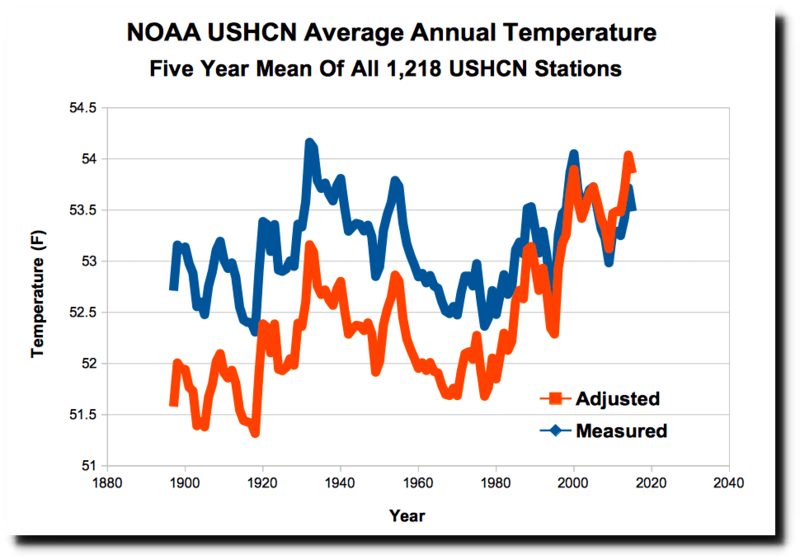 The second problem is that they release graphs with no annotation that the data has been altered – people assume that the data is representative of the thermometer record, and it isn’t. The third problem is that they are altering the data to match their theory, the exact opposite of how science necessarily must operate. And the fourth problem is that the alterations are largely due to modeled data, generated in lieu of missing thermometer data – which they are losing at an alarming rate. Almost half of NOAA’s monthly US temperature data is now fake. Their handling of data would make even Enron accountants blush.